There has been a lot of finger pointing in who is to blame for this horrible drought we are in. It seems like every time I check my email or social media, I see another article blaming someone. It is sad to me that we are always looking to blame someone. We are here. Regardless of whose fault it is, we are here in this drought together. Instead of looking to blame someone I am going to give you a little back story to how we got here and let you decide. Or even better, don’t decide or pick a side. Instead let’s look ahead and see how we can move forward. But, in order to move forward we must understand the past. Water in California is first divided into developed and undeveloped. Undeveloped stays in the environment. Developed water usage in California is broken into three categories; 50% goes to the environment, 40% to agriculture and 10% to urban. Many people don’t consider the environmental use of water when looking at water uses. I say it must be considered because it is still water that is being used and could be used for another purpose. Environmental water is water flowing through rivers protected as ‘wild and scenic’, water used to maintain habitats within streams, supporting wetlands and wildlife preserves, and water required for delta outflow. Yes, we pump water into ocean. Why? We have a non-native fish called the delta smelt that the environmentalists say we must protect! It is estimated that 21 million acre feet of water is released to the ocean annually to save our non-native fish. Urban water is used for residential, commercial, industrial and large landscape uses. 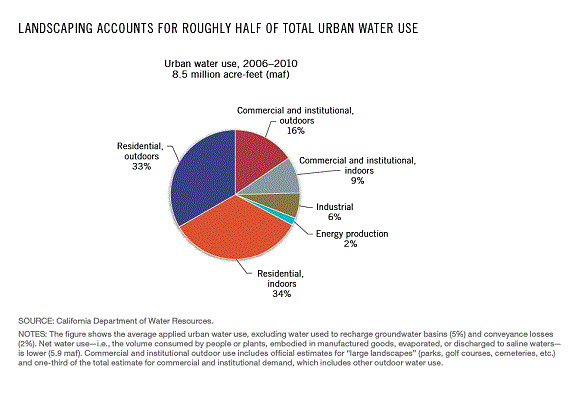 While landscaping being the largest consumer of water for urban use the graph below depicts best how urban water is used. California State receives most of the rain and snow in the north end of the state, whereas most of the population is in the south and the majority of agriculture in the Central Valley. We developed a series of canals, reservoirs, dams and an aqueduct to store and transport this water where needed. Let me add quickly that 70% of our water is released to the ocean because we don’t have enough storage systems in place during wet years. California water is made up of three types of systems. The Central Valley Project is the federal water system developed by the US Bureau of Reclamation back in 1933 to transport water from Northern California to the Central Valley. On an average year, 7 million acre-feet of water flows through the CVP. 5 million going to agriculture in the Central Valley, 600,000 acre feet goes to municipal and industrial users and 800,000 acre feet is released into rivers and streams for environmental purposes. The last two years, federal water has been cut by 100% to agriculture. That’s right, growers are receiving a ZERO allocation and still are required to pay for the water they are not receiving. The State Water Project is the state water system that began in 1957 and allocates 70 percent of its supply to urban uses and 30 percent to agriculture uses. 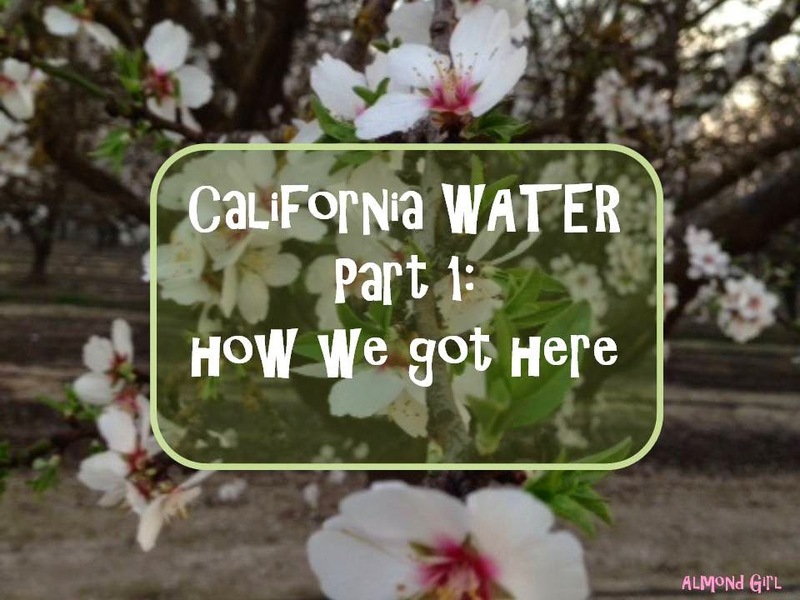 SWP sends water to 2/3 of the California population and about 750,000 acres of agriculture farmland. This year, there is an 80% cut in state water to agriculture. Agriculture water districts have a 20% supply of their full allocation, but some farmers are still receiving zero water due to different classes, contracts and varying water rights. Both of these projects were created to ensure our water table would be able to sustain as well as provide enough water for farmers to grow their crops and cities to thrive. Being that our population has more than doubled in the last 20 years and no new dams or reservoirs have been built to handle this population we are running out of water. Farmers have been able to drill water wells and pump their groundwater to supplement the water they aren’t receiving from federal or state water. California has large groundwater reservoirs as well; we also have the largest groundwater basin in the United States. Farmers are replenishing the groundwater basin each and every time they irrigate. The water goes to the crop and its root zone, as well as leaching into the soil and rebuilding the basin beneath it. During an average year the groundwater in California accounts for 38% of the total water supply. During a dry year that number rises to 46% because we have less state and federal water due to a decrease in snow and rain. This was all the procedure until last year. Last year, the state passed legislation to control our groundwater and how much we are pumping. So, the government is controlling our groundwater basin, cutting agriculture 100-80% of its supply for federal and state water, urban is only cut by 25-35% and we continue to flush water into the ocean to save our non-native fish. With little to no federal and state water, and the strings being pulled tighter on groundwater, where will your next meal come from? Stay tuned for the next series to cover more!